I saw the Climax restoration at Cass over Memorial Day too. Having seen the engine shortly after the shop fire and several times since the only word that comes to mind is amazing. If I lived closer I would be like to work on that one. The Heisler at Durbin is actually a three trucker, a very tired three trucker. The Skookum is now at the Oregon Coast Scenic Railway, and I think it's under restoration, but I do not know the current status. It stored at MRSR while it was owned by Rogam Coombs (hope I spelled that right) but since it was privately owned, no restoration work was done on it while there. It has since been purchased by OCSR and moved off site quite a few years ago. The following is a progress report on the Skookum I received from the OCSR yesterday. The Skookum is progressing forward. Boiler repairs are almost done and this spring we should be doing the FRA internal inspection. The tender is basically done only some brake rigging and plumbing. Both tanks are new and a bunch of frame repairs, it was a mess. We are currently doing the new shoes & wedges for the low-pressure running gear (front). Already done on this gear are new axles, new crown brasses, new crank pins, new pony boxes, new pony cellars, new pony brasses, among other things. We don't work on this project much during our operating season and the work required to place this locomotive back into service has surpassed everyones estimates. The owner and our staff are determined to complete this job. We are hoping to have it out in the next two years. Work on the Cass Climax is going remarkably well as of late. In October the frame was sandblasted and painted. 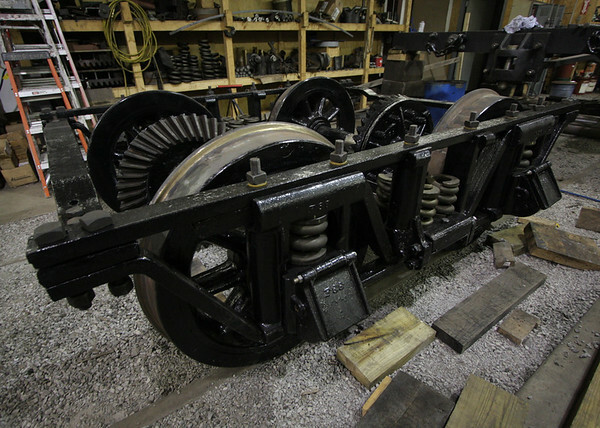 We are now working on getting the trucks completed and under the frame of the locomotive. 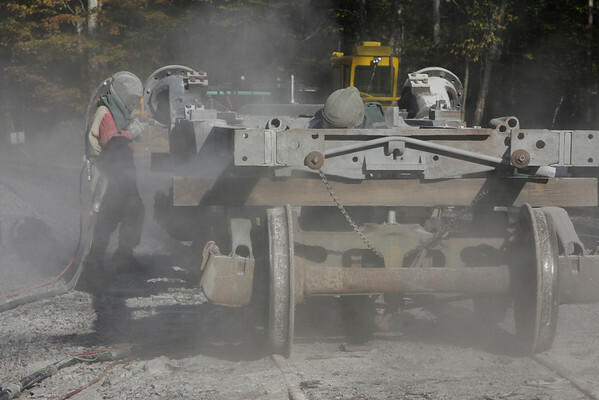 If you would like to volunteer on the Climax work weekend dates are posted at the link below. Yakima Valley Rail and Steam Museum Association is in the process of a complete rebuild of Northern Pacific S-4 class 4-6-0 at Toppenish Washington. They have a great deal of the work done, but I haven't seen an update in a couple years. I'd sure like to know what's happening with it. I was one of the original people involved with this engine, repainting it while on display in Pt. Defiance park back in the mid 60's, and later moving it for an aborted restoration attempt with Jack Anderson. You're right. I inquired about this project sometime last year and got no response. Generally speaking, no response = no progress = no $$$, unless of course they are so busy getting work done that they decide not to take the time to keep the railfan world abreast of their work. Maybe a little premature to post here, but PSRM in Campo, CA, is working on Coos Bay Lumber Co. #11, a 2-8-2T (ALCO, 1929). We've been removing tubes and firebrick, etc., and cleaning up the boiler in preparation for a ultrasound. This should be completed in the next few months. IF (a big IF) the boiler looks to be in pretty decent shape, we will continue to evaluate what else needs to be done, and if it appears feasible, will take a shot at restoration. You are correct that the 1364 progress has slowed, but work has been progressing. The new tender tank was completed and moved on site last fall. It will be sandblasted, painted and installed on the completely rebuilt tender frame as time allows. Your ideas regarding the slowdown are partially correct; money was tighter and energy had to be devoted to projects that would ensure museum viability, ie, not be a money pit like an operational steam locomotive might be. Another project intervened as well and that is NP 2152 which came available and required a lot of energy and money to get moved from Auburn, WA. Fortunately finances have improved and the museum is once again on solid ground. Other revenue generating projects are progressing and 1364 work should pick up over the next year. We are actually quite proud of the accomplishments of the past year. If only there were another 10 or 15 volunteers to enable projects to proceed a little faster. Notify me if you want bring your gloves when you visit. Sure would love to have an entire summer to donate my time to a project like yours! Thanks for taking the time to give us an update. Glad to hear things are moving forward. That is good news in today's economy and somewhat surprising that so many projects are still funded and moving forward. Here's hoping 2010 brings much progress to your project! Doug, I just reviewed the pics on your website and it sure looks like 1364 herself was in the reassembly phase and that the tender was the last major component to be completed. Is that assessment correct? Can you provide a little more detail on waht work actually remains on the engine? It is satisfying to see the precision and attention to detail your folks have given to the restoration of this engine, particularly the pics of the cab, cab floor and backhead appliances being reinstalled on the backhead. I shot this picture during Trainfest...isn't this No 76? Yep, that's Mississippian #76. I don't know the current status, other that it was in the process of being rebuilt. I think SRI's main focus right now is getting major funding for 1225. Unfortunately, SRI recently laid off the people who maintained their steam locomotives. SRI needs a lot of help right now, Trainfest 2009 broke the organization's bank. The Prairie that's under restoration in PLA's NCRy. Brightside yard is Sierra Railway #30, whose restoration will restart within 2 years. Keep up the fine work on the 1364. Those NP 4-6-0s were very attractive engines. To all of those interested in the restoration of Northern Pacific 1364 in Toppenish. The locomotive is now on its spring/equalizing gear, and the brake rigging is on, one brake cylinder is giving us problems, that is soon to be resolved, i hope. The valves are next, then rods, complete the air system and then on to fire pan. Past that we will see how far the money goes. A question, does anyone have pictures of the oil conversions on the s4's? and if anyone wants to help out with the restoration please let me know. LS&I 2-8-0 #20 that is privately owned and at the old Kettle Moraine shop in North Lake, Wisconsin. Since you're familiar with the Kettle Moraine, what became of their neat little 2-6-2 #9 (Originally McCould River RR No. 9)? I was just watching a "last run" video of it (2001) online. According to several websites, it was donated to the National Rail Museum in Green Bay. But the NRM roster doesn't show a #9. I read elsewhere that it is stored somewhere in Wisconsin. Kind of confusing.